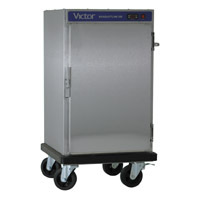 This unit is suited to the smaller operation with the ability to transport food from the kitchen to the dining area where a high degree of portability is required. This unit comes with heavy duty castors and wrap around bumper. This model is also able to fit Gastronorm containers 1/1 on the shelf brackets eliminating the need for additional shelves. Heated Banquetline cabinets are constructed from stainless steel with robust all-round bumper, strong door latches and strong adjustable hinges. All units are mounted on 150mm heavy duty castors as standard with 2 braked.All units operate from a 13amp supply. Heated units are factory set at 85°C and 95° C and are complete with a digital temperature read-out on the microprocessor control. Combination units require eutectic plates not included in the price.